Reliance Communications chairman Anil Ambani today appeared before Parliament’s Public Accounts Committee (PAC), which quizzed him for over two hours in connection with alleged irregularities in 2G Spectrum allocation. The CBI and the government had a face-off in the Supreme Court today on the proposed appointment of senior advocate UU Lalit as the Special Public Prosecutor for the trial of former Telecom Minister A Raja and other accused in the 2G Spectrum scam case.Attorney General GE Vahanvati opposed the appointment of Lalit on technical ground that under the provisions of Prevention of Money Laundering Act, the special PP should have been a counsel for a state or the Centre for at least seven years. A Division Bench of the Supreme Court has referred to the Chief Justice of India a PIL questioning the constitutional validity of the present collegium system of appointment of judges in high courts and the SC. The Parliament’s Committee on Estimates is scheduled to commence from tomorrow the scrutiny into the Indian Space Research Organisation (ISRO) commercial arm Antrix Corporation’s deal with Bangalore-based Devas Multimedia, which was annulled by the government amid a controversy. After the Shunglu committee underscored financial irregularities and the whopping loss to the public exchequer caused in the Commonwealth Games’ projects undertaken by the Delhi Development Authority and the Central Public Works Department, the CBI today registered a case against seven government officials and a Delhi-based private firm. Hitting the campaign trail in Assam, AICC general secretary Rahul Gandhi today said that the Congress was the only party in the country which took tough action against corruption.It was in reaction to the sustained campaign of rival political parties, the BJP and the AGP, which have been targeting the UPA at the Centre and the Congress regime in Assam over corruption issue. Tarun Gogoi has well understood that he will need sufficient divine blessings to become the Chief Minister of Assam for third time in a row after polls. Otherwise why should he take the pain to take a bow in the company of his better half Dolly Gogoi at all the temples, churches and mosque in his home town Jorhat after casting his vote in the first phase of elections on Monday. As the health condition of the renowned Godman, Satya Sai Baba, continues to be critical, thousands of anxious devotees thronged his spiritual abode Puttaparthi in Andhra Pradesh and offered special prayers for his recovery.Eightyfive-year-old Sai Baba was admitted to Sri Satya Sai Institute of Higher Medical Sciences Hospital at Puttaparthi last week with pneumonia, renal failure and high diabetes. Veteran journalist Ajit Bhattacharjea, who died yesterday, was cremated here today at the Lodhi Road Crematorium.The funeral was attended by a large number of his friends and admirers, who paid rich tributes to one of the towering figures of the Indian media. His son performed the last rites. BJP leader LK Advani, veteran journalists Inder Malhotra and BG Verghese, senior editor Sanjaya Baru and his family and friends attended the funeral. Ambani, also a former Rajya Sabha member, reached Parliament premises around noon when the PAC was questioning Etisalat DB Telecom CEO Atul Jhamb. The members asked Ambani to join them just after 1:00 pm and discussions with him continued for nearly two hours. He was asked questions on issues related to the 2G Spectrum allocation, as also 3G auction that was held last year. “He was very free and frank,” said a PAC member. Another member said Ambani referred to the CBI chargesheet in the 2G allocation case and expressed his inability to speak in detail as the matter was sub-judice. He is understood to have justified the “first come, first serve” policy in the allocation of 2G Spectrum and favoured the auction route for 3G Spectrum allocation. Jhamb, who appeared before the PAC along with his senior colleagues from Etisalat DB, was quizzed by members for over two hours. The company officials told the committee that Shahid Balwa, who is in CBI custody in connection with the 2G scam, was a partner. S-Tel CEO Shamik Das was also questioned by the PAC while Unitech Wireless Managing Director Sigve Brekke is to appear before it. The PAC had yesterday quizzed Tata Group chairman Ratan Tata and corporate lobbyist Niira Radia in connection with the 2G Spectrum scam. The CBI and the government had a face-off in the Supreme Court today on the proposed appointment of senior advocate UU Lalit as the Special Public Prosecutor for the trial of former Telecom Minister A Raja and other accused in the 2G Spectrum scam case. Attorney General GE Vahanvati opposed the appointment of Lalit on technical ground that under the provisions of Prevention of Money Laundering Act, the special PP should have been a counsel for a state or the Centre for at least seven years. The government’s resistance has come despite the fact that the Bench comprising Justices GS Singhvi and AK Ganguly had approved the CBI’s proposal for appointing Lalit as special PP. Senior counsel KK Venugopal had told the Bench, monitoring the CBI probe in the scam, that he had to persuade Lalit to be the CBI’s counsel for the case as the senior advocate was reluctant to take the offer. Venugopal said he convinced Lalit telling him that the CBI required the services of a senior advocate well-versed in criminal law to nail the culprits responsible for the scam in view of the magnitude of the scam and the huge public interest involved in the case. The AG sought a week’s time for the Centre to decide on the issue of special PP. Appointing some one giving a go by to the norms would lead to legal hurdles at a later stage and impede the progress of the trial to be conducted on a daily basis by a court headed by Special Judge OP Saini, he contended. The Bench, however, asked the AG to take a decision on the issue by Friday, April 8. While referring the issue to the CJI, a Bench comprising Justices Deepak Verma and BS Chauhan listed in its order the 10 issues raised by amicus curiae, appointed by the court to assist in adjudicating the PIL filed by a non-governmental organisation, Suraj India Trust. The collegium system has been in practice since the 1993 ruling of a nine-judge Bench of the SC in a case titled Advocates on Record Association versus Union of India and others. The Bench passed the order yesterday after Attorney General GE Vahanvati contended that a two-judge Bench could not examine the correctness of the judgment of nine judges. The AG also questioned the locus standi of the petitioner for seeking review of the SC verdict. Nevertheless, the AG agreed on the need for reviewing the SC judgment that heralded the system of collegium, comprising senior-most judges of the SC or the HCs. According to the amicus curiae -- senior advocate AK Ganguly -- 10 issues had arisen from the PIL. These included as to whether the 1993 SC verdict and a similar apex court judgment in 1998 amounted to amending Article 124(2) of the Constitution, which did not provide for the collegium system. Another aspect was the legality of amending the Constituion through a judicial verdict as this could be done only by Parliament under Article 368.
were expected to present themselves in front of the committee and give a complete briefing. The committee, chaired by Congress MP Francisco Sardinha, would go into various aspects of the controversial deal under which Antrix Corporation had agreed to lease bulk space segment in S-band on two satellites to Devas Multimedia. Late last month, the committee decided to examine the allocation of S-band spectrum by ISRO with special reference to the Antrix-Devas deal. The CBI raided 20 places in Delhi and Noida, including the offices and residential premises of the accused officials. “Incriminating documents have been recovered during searches,” the spokesperson said. The accused against whom the FIR was registered have been identified as Umesh Kumar, superintending engineer, DDA, NH Khan, executive engineer, DDA, Dineswar Gaur, superintending engineer, CPWD, Rajinder Kala, superintending engineer, CPWD, Kailash Taneja, junior engineer, DDA, and two other officials. Two directors of Jubilee Sports, Siddharth Verma and Rajiv Verma, have also been named in the FIR. The Shunglu panel had alleged that the tenders were rigged in favour of a few selected private firms and budgets were inflated as officials knew that money was not in short supply for the CWG works. As the government ran against the deadline to complete all works, public fund was diverted liberally to the CWG, allowing the nexus of corrupt government officials and private contractors to loot the exchequer, it had alleged. Hitting the campaign trail in Assam, AICC general secretary Rahul Gandhi today said that the Congress was the only party in the country which took tough action against corruption. It was in reaction to the sustained campaign of rival political parties, the BJP and the AGP, which have been targeting the UPA at the Centre and the Congress regime in Assam over corruption issue. Addressing three election rallies in the state for three youth Congress leaders - Rekibuddin Ahmed, Jitu Kissan and Pijush Hazarika - who are contesting from Chaygaon, Majbat and Raha constituencies, respectively, Rahul said it was due to the RTI Act implemented by the UPA government that many cases of corruption have been exposed in the country. “The RTI Act has empowered the people and now they have access to any information they want from the government,” said Rahul. “The Mahatma Gandhi National Rural Employment Generation Act of the UPA government is a proof of the Congress’ commitment to uplift rural poor. The MNREGA is not mere a scheme but an Act that compels government to provide employment to jobless for 100 days in rural areas,” said Rahul. 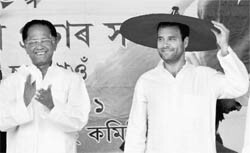 The young AICC leader hailed the success of Tarun Gogoi-led Congress government in the state for facilitating overall economic development, infrastructure development, restoration of peace since the party came to power in Assam in 2001 and asked people to make Gogoi the Chief Minister once again to lead Assam further on the path of development. 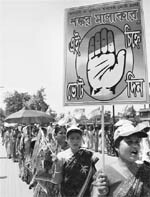 “When the AGP was in power in Assam before the Congress, peace was a far cry while development activities were no where to be seen. The employees were not getting salaries regularly. Today, the situation has completely reversed with the state registering much better economic growth rate of 8 per cent,” Rahul said in one of the rallies. Delhi Chief Minister Sheila Dikshit on Tuesday got the real taste of power in Assam. While she was telling the media at the Rajiv Bhawan this afternoon about the impressive work done by the incumbent Congress government in Assam during the past 10 years, the power went off. West Bengal Chief Minister Buddhadeb Bhattacharjee does not own a house or a car and he stays in a rented government flat and has just Rs 5,000 cash in hand. Bhattacharjee, who is the CPM candidate for Jadavpore assembly constituency, said in his affidavit filed with the Election Commission that his income for the year 2009-10 was Rs 1,00,920. Bhattacharjee has no bank deposit, investment, FD or jewellery. The Chief Minister has no immovable or movable property, farm land, non-agricultural land, commercial or residential building in his own name nor has he inherited any property. The income tax return of Bhattacharjee's wife Mira, however, shows she has an income of Rs 6,70,135 in 2009-10, movable asset valued at over Rs.31 lakh including bank deposits, jewellery and investments. The anti-talks faction of the banned ULFA which threatened to disrupt polls in Assam by targeting Congress men was well snubbed by voters, who turned out in big number to exercise their right to franchise. An impressive 73.04 per cent voter turnout was registered in the first phase of Assam Assembly elections that covered 62 constituencies spread across 13 districts. Additional Chief Electoral Officer MC Sahu, on the final compilation of statistics for the first phase, on Tuesday said while 74.10 per cent male exercised their franchise, female voters registered 71.91 per cent turnout. 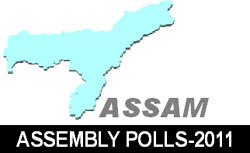 The highest 79.64 per cent polling was recorded in Lakhimpur constituency, once a stronghold of the ULFA. It has been known that Railway Minister Mamata Banerjee dabbles in both poetry and painting. She has several published books of poetry and now that she is widely expected to become the next Chief Minister of West Bengal, her paintings, too, seem to have found admirers, who shelled out Rs 50 lakh and bought 20 of the 98 paintings displayed at an exhibition in Kolkata this week. The buyers were the ‘usual suspects’, industrialist Harsh Neotia and businessman and Cricket Association of Bengal (CAB) chief Jagmohan Dalmiya. The sale proceeds will go to support her party mouthpiece ‘Jago Bangla’. Two earlier exhibitions by her, in 2003 and 2007, had managed to sell paintings worth Rs 4 lakh and Rs 10 lakh, respectively. Didi is certain to fetch even higher bids for her paintings after she takes over as the Chief Minister. ventilation through ventilator and the CRRT, which is a slow dialysis process," a medical bulletin issued by the hospital director Dr AN Safaya said. The rumours have been doing the rounds that the doctors were deliberately suppressing the facts about Sai Baba’s health condition.